Summer 2018 has been busy and eventful for the World’s Strongest Violinist Evan Pittman. 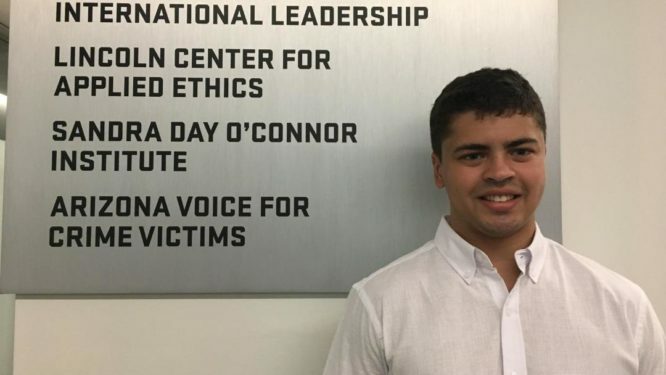 Upon arriving home in Phoenix after completion of his freshman year at Brown University, Evan began two Summer Internships – conducting research with the Arizona First political action committee in Central Phoenix in preparation for the 2018 election cycle, and working with researchers and archivists at the Sandra Day O’Connor Institute in downtown Phoenix. Both opportunities provided the chance to study and conduct research on Arizona political issues and, in the case of the O’Connor Center, to research the career and writing of Supreme Court Justice O’Connor. Early in the Summer, Evan also learned he had received the Greater Phoenix Mensa Scholarship, and a scholarship for military family members. Continuing his academic journey, he enrolled in an advanced calculus class during July and August; he also continued his high-intensity sports and physical training in powerlifting, sprinting and springboard diving, training twice a day, six to seven days a week throughout the Summer. In the middle of August, Evan learned he had been selected by the Amateur Athletic Union as 2018 AAU Strength Sports National Male Athlete of the Year, and 2018 AAU Junior Powerlifter of the Year for his 2017 competition year, when he became the only powerlifter in history to break world records in nine different weight classes and won the national AAU Junior Olympic Games combine for the fourth time. Evan was the top male vote recipient among AAU junior and senior athletes of the year in powerlifting, weightlifting, and the Feats of Strength strongman competition.